Evernote is a behemoth when it comes to organizing and keeping track of all your important notes in one centralized location. But if you’ve been using it for a while, and it’s packed with notes, bookmarks, images, business cards, and more, it can become a little unwieldy to use. Using a few helpful-but-often-overlooked shortcuts, you can bring Evernote back under control. In fact, with this nifty feature, you can create shortcuts to all kinds of things: notebooks, individual notes, tags, and even frequently used searches. Web Users: If you’re using the web interface, navigate to the content, and when it’s open, click the star in the menu at the top of the page. You can also do it from the list of items in the navigation bar. Hover over the note, notebook, or tag, and click the star button to add it to your shortcuts. Desktop Users: Whether you’re using Windows or Mac, you can right-click the item in the navigation list and select “Add to Shortcut”. Both Windows and Mac users can simply drag and drop items into the Shortcut panel in the vertical menu. Mac users have the added option of using the keyboard shortcut, Control-Click, to pull up the menu. Mobile Users: In iOS, the method differs depending on the item. For Notebooks or Tags, you will have to navigate to them on your phone, open them up, and click the star button in the bottom right-hand corner. For Notes, you’ll have to open up the note, tap the three dot menu button in the bottom right-hand corner and select “Add to Shortcuts”. For Android users, the process is simpler: hold down on the note, notebook, notebook stack, or tag, and tap “Add to Shortcuts”. 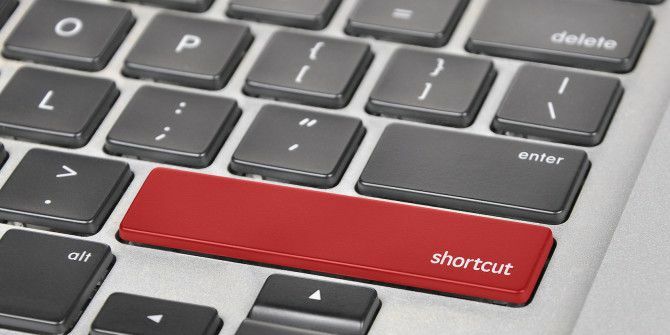 Creating shortcuts only works on the desktop apps, using the drag-and-drop feature. On your Mac or Windows, click on your search bar to pull up your saved searches, and drag the ones you want to add to shortcuts to the button in the vertical menu. If you don’t know how to save searches on Evernote, we walk you through it in our overview of these five powerful Evernote features Maximize Evernote with 5 Powerful Features Maximize Evernote with 5 Powerful Features With over 100 million users, Evernote is arguably the web's favorite productivity and note-saving tool. We are putting the spotlight on 5 under-appreciated Evernote features and detail their value. Read More . All shortcuts can be accessed from the vertical menu. If it’s in collapsed mode, the Shortcut panel is labeled with a star. You can remove items from Shortcuts on your desktop or web app by navigating to the shortcut list and hit the dash button next to each item. You can remove them from the desktop apps using the right click menu. In iOS, you can navigate to the list and swipe left on each item to delete, or you can use the same method for adding items to Shortcuts. Tap the three dot menu button and choose “Remove from Shortcuts”. In Android, hold down on the item and tap “Remove from Shortcuts”. What other tips and tricks do you have for keeping your Evernote content organized? Let us know in the comments. Explore more about: Evernote, Organization Software. Shortcuts are good, but using them per note only pushes back the complexity problem one level. If you really have lots of notes and notebooks then a better tip is to create a "meta-note" that holds a list of note links, then add that as a shortcut. Say you have a "Projects" notebook with a whole bunch of notes. Each note is a separate task with description, details, blah, blah. Some of those tasks are high priority, some not so much. You could create sub-notebooks for high, medium & low priority tasks, but then you create the "drill down" complexity / navigation problem. Instead, create a note called "Important Project Tasks" and then add a note link for each task note that's high priority. You're essentially creating a "note of note-links". Then set this "meta-note" as the shortcut. The only negative is that currently "Copy Note Link" doesn't appear to have a keyboard shortcut, so it's a bit laborious to go through each note you want to appear as a link in the "meta-note" for the first time. But once you set it up (and you can have several meta-notes as shortcuts) then it becomes easy to maintain over time. Actually, in the old web interface (not sure about the crippled new beta one) you can drag saved searches from the list at the bottom of the search box to the shortcuts list. These are accessible as soon as you click in the search box. And for anyone who isn't sure how to create them, that is easy too. Once you start adding tags, notebooks, and other operators in the search box, an option to "Save this search" will appear in blue beneath the search box and at the top of any other saved searches. If you only add words but no operators, the save option doesn't immediately appear, but if you then click on "Search", then click on the search box once again, you will see the "Save this search" option. I think color labels for notebooks or only notes would be very helpful.